Investment growth in emerging market and developing economies (EMDEs) has slowed sharply since 2010, declining from 10% on average in 2010 to less than 3.5% in 2016 (Figure 1). Investment growth is now not only well below its pre-crisis average, but also below its long-term average in the highest share of EMDEs in 25 years [TIM1] (with the exception of the Global Crisis). The slowdown in EMDE investment growth has been most pronounced among the BRICS, commodity-exporting economies, and regions with a large number of commodity exporters. EMDEs with investment growth below the long-term average account for 35% of global GDP and contain 71% of the world’s population and 73% of the world’s poor. Notes: Weighted averages. Includes 28 EMDEs with available quarterly data. Long-term averages start in 1991 for EMDEs and are based on annual data. Last observation is for Q4 2016. Missing data for investment growth in Q4 2016 for 13 EMDEs assumed to be constant at Q3 levels. Sources: Haver Analytics, International Monetary Fund, Oxford Economics, World Development Indicators, World Bank. Notes: Weighted averages. Long-term average starts in 1991 for EMDEs due to lack of earlier data. The EMDE sample includes 126 economies. Ex BRICS excludes BRICS economies within each group. 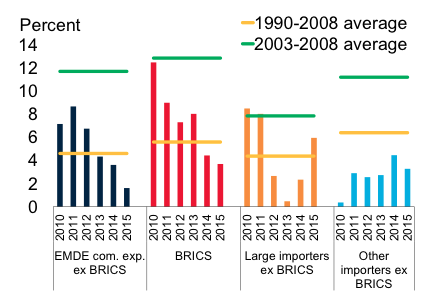 Large importers refer to the seven EMDE commodity importers ranked in the top 20 EMDEs (ex BRICS) in nominal GDP terms. Other importers include 42 economies. The persistent weakness in investment growth presents a challenge to policymakers because, by slowing capital accumulation and technological progress embedded in investment, it has contributed to the sluggish growth of potential output in recent years. At the beginning of 2017 there have been tentative signs of acceleration in activity in some EMDEs. There has been also been debate about the drivers of and policy responses to post-crisis investment weakness (Aslam et al. 2015, Buti and Mohl 2014, Morkunaite and Huefner 2014). This column, based on Kose et al. (2017), tries to shed light on this debate by analysing the investment slowdown in EMDEs. 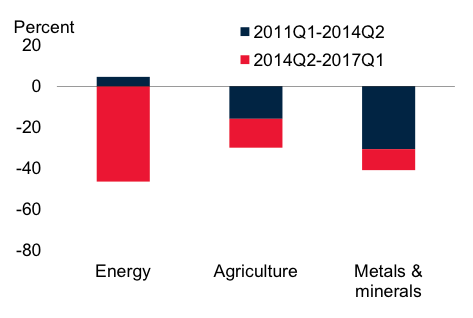 Which factors are slowing investment growth? We estimated a panel regression model to determine the relative role of external and domestic factors when explaining the investment growth slowdown, using a sample of 73 EMDEs and 26 advanced economies. The results suggest that many factors contributed to the slowdown in investment growth in EMDEs. Weak activity. Whereas investment weakness in advanced economies reflects mainly sluggish output growth, investment weakness in EMDEs is associated with a larger number of factors. Weak output growth can account for three-quarters, on average, for slowdowns in investment growth among advanced economies during 2011-15, it accounted for a small share of the investment growth slowdown in the average EMDE. Negative terms-of-trade shocks. In oil exporters, on average, the negative terms-of-trade shock caused by the decline in oil prices starting in 2014 accounted for about half the investment growth slowdown. 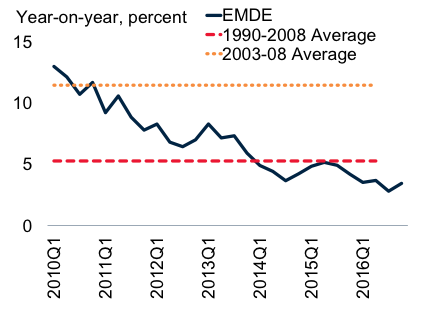 Post-crisis investment growth in EMDEs with the sharpest terms-of-trade deterioration was much lower (Figure 2). Slowing FDI inflows. In commodity importers, on average, slowing FDI inflows accounted for more than half the slowdown in investment growth (Figure 2). Partly as result of this decline, post-crisis investment growth in the one-third of EMDEs with the largest declines in FDI inflows was half that of the one-third of EMDEs with the largest increases in FDI inflows. Rising private debt burdens. Private sector debt-to-GDP ratios have had non-linear effects on investment. With mounting private debt burdens, the beneficial effects of financial deepening on investment are increasingly outweighed by negative effects of debt overhang. In several non-energy commodity exporters, high private debt has also reduced investment. Some energy exporters initially had moderate post-crisis private debt stocks, but a rapid build-up of private sector debt has held back investment growth. Growing political risk. 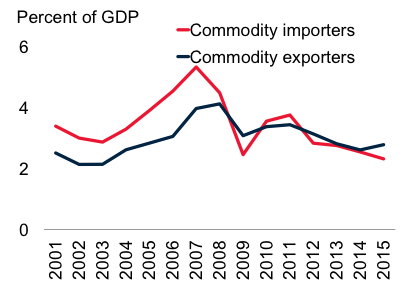 The increase in political uncertainty accounted for about one-tenth of the slowdown in investment growth in commodity-importing and exporting EMDEs since 2011. In the short term, some of these problems for investment growth are expected to improve, but gradually. Investment growth is therefore expected to remain weak. Figure 2 Commodity prices, FDI inflows and investment growth. Notes: Energy index includes crude oil (85% weight), coal, and natural gas. Agriculture index includes 21 agricultural commodities. Metals and minerals index includes 6 metals traded on the Land & Metal Exchange, plus iron ore. 2017 Q1 denotes January and February only. Notes: Low and High indicate annual terms of trade growth in the bottom and top one-third of the distribution, respectively. 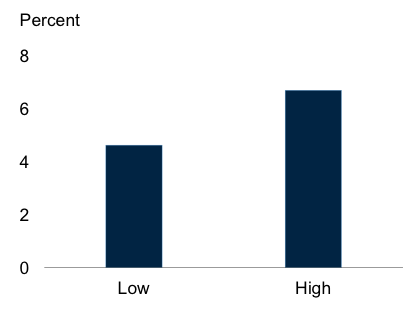 Difference in medians between high and low subsamples is significant at the 5% level. Group medians for 108 EMDEs during 2010-15. Notes: Gross FDI inflows as ratios to GDP. Weighted averages. Includes 75 EMDEs. Notes: Low and High indicate annual change in the FDI to GDP ratio in the bottom and top one-third of the distribution, respectively. 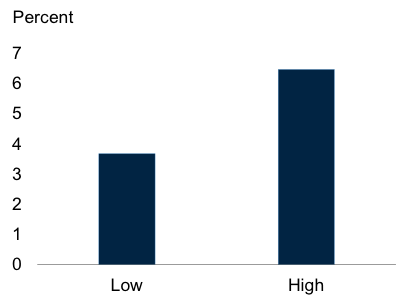 Difference in medians between high and low subsamples is significant at the 5% level. Group medians for 120 EMDEs during 2010-15. Which policies can stimulate investment growth? Many EMDEs have large unmet investment needs (Figure 3). First, many economies are poorly equipped to keep pace with rapid urbanisation and changing demands on workers. Second, investment is also needed to smooth the transition away from growth driven by natural resources (in commodity exporters) or non-tradables (in some commodity importers) towards more sustainable sources of growth. Finally, a boost to private investment would help revive slowing productivity growth. 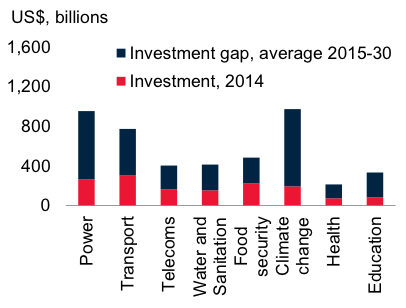 Notes: The figure shows required global investment in infrastructure (2015-30, as a percentage of GDP) as projected by McKinsey. Sources: McKinsey Global Institute, World Bank (2016b), World Bank, UNCTAD (2014). Notes: Investment refers to capital expenditure. Upper bounds for the estimated investment needs are reported. Red column denotes 2014 or latest year. SDG refers to UN Sustainable Development Goals. Although specific policy needs depend on circumstances, in order to have a sustained improvement in investment growth prospects it would be necessary to employ a full range of available policies, which means both counter-cyclical fiscal and monetary stimulus and structural reforms (World Bank 2017, Vashakmadze et al. 2017). Fiscal policy measures would help by directly expanding public investment, while monetary policy could boost activity mainly through lowering the cost of finance for investment (World Bank 2016a). Lower startup costs. These are associated with higher profitability of incumbent firms, greater investment in information and communications technology, and more beneficial effects of FDI for domestic investment. Reduction in trade barriers. Reforms would encourage FDI and aggregate investment. Corporate governance and financial sector reforms. These may improve the allocation of resources, including capital, across firms and sectors. Labour and product market reforms. If they increase firm profitability, they may encourage investment. Stronger property rights. Rights encourage corporate and real estate investment. Improved access to power supply. This increases firm investment and productivity. Progress in improving the business climate has slowed in EMDEs since 2011. During the six years before 2011 the cost of doing business, compliance times to meet regulations, and the number of regulatory procedures dropped considerably. On average during 2006-11, EMDEs moved 6-10% closer to best practices in these dimensions. Since 2011, improvements have continued but, on average, at a slower pace. Trade and financial integration agreements can demonstrate a binding commitment to reforms that will have the collateral benefit of improving the investment climate (Kose et al. 2009). In an enhanced investment climate, stronger investment would also improve trade flows, as investment weakness has been a major driver of the recent slowdown in global trade. Regional trade agreements can help lower non-tariff barriers, encouraging FDI and deepening supply chain integration (World Bank 2016a, 2016b). To be sustainable, these agreements need to be supported by measures to compensate vulnerable groups that could be adversely affected. Aslam, A, S Beidas-Strom, D Leigh, S G Park and H Tong (2015), “Explaining the Dearth of Private Investment”, VoxEu.org, 18 April. Buti, M, and P Mohl (2014), “Lackluster Investment in the Eurozone: Is There a Puzzle?”, VoxEu.org, 04 June. Kose, M, E Prasad, K Rogoff, and S Wei (2009), “Financial Globalization: A Reappraisal”, IMF Staff Papers 56(1): 8-62. Kose, M, F Ohnsorge, L Ye, and E Islamaj (2017), “Weakness in Investment Growth: Causes, Implications and Policy Responses”, World Bank Working Paper 7990. Morkunaite, K and F Huefner (2014), “Causes of the G7 Fixed Investment Doldrums”, VoxEu.org, 27 November. Vashakmadze, E, G Kambou, D Chen, B Nandwa, Y Okawa, and D Vorisek (2017), “Regional Dimensions of Recent Weakness in Investment: Drivers, Investment Needs and Policy Responses”, World Bank Working Paper 7991. World Bank (2015), Having Space and Using It. 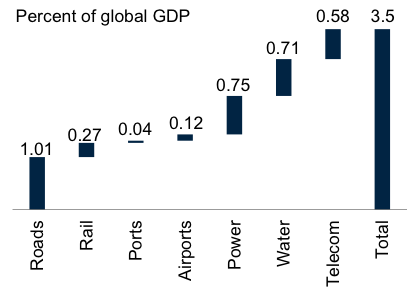 Global Economic Prospects, January 2015. World Bank (2016a), Spillovers amid Weak Growth. Global Economic Prospects, January 2016. World Bank (2016b), Divergences and Risks: Global Economic Prospects, June 2016. World Bank (2017), Weak Investment in Uncertain Times. Global Economic Prospects, January 2017.